I have started setting up the endeavour currently known as Rebecca Industries during my weekends. I am going to run Rebecca Industries in an agile style, so I have set up my wall in The Penthouse (Rebecca Industries HQ) and on Trello. I was inspired by Emily Webber on the wall-at-home. 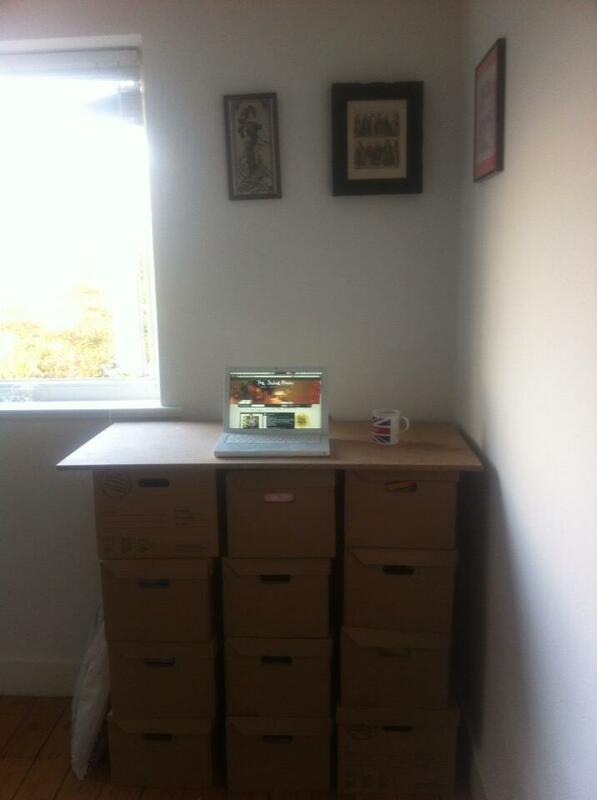 I have assembled a standing desk by placing a plank of wood on top of a stack of boxes which I euphemistically call My Archive. I hope one day to have done something significant enough that I can donate it to an international institution, but for now it’s just boxes full of essays I wrote for my masters and posters for club nights I used to run. Yes, my computer is very old. No, my Take That mug is not ironic. I am collating the advice that people who have made the transition to working for themselves have given me. This is going to be a very valuable resource and I look forward to passing on my experiences to others in future. And most importantly I have handed in my notice at GDS. It has been wonderful to hear from people they value my contribution to GDS and have enjoyed working with me. It is also wonderful that I will continue be part of the GDS family and involved in digital government in future. Sad to see you leave GDS, but I’m sure you’re going on to do some great things and that we’ll see you around the offices from time to time. I would love to know how you’re wall is going and how it progresses.